This article is about the fictional planet in Star Wars. For the exoplanet sometimes known as "Coruscant", see Kepler-452b. Coruscant (/ˈkɒrəsɑːnt/)[a] is an ecumenopolis planet in the fictional Star Wars universe (in the Coruscant Subsector of the Corusca Sector of the Core Worlds). It first appeared onscreen in the 1997 Special Edition of Return of the Jedi, but was first mentioned in Timothy Zahn's 1991 novel Heir to the Empire. Coruscant was historically referred to as Notron or Queen of the Core; was renamed Imperial Center during the reign of the Galactic Empire (as depicted in the original films) and Yuuzhan'tar during the Yuuzhan Vong invasion (as depicted in the New Jedi Order novel series). The planet's capital city was initially Galactic City (built at least in 100,000 BBY,[b] partially destroyed in 27 and 44 ABY);[c] under the Galactic Empire this was Imperial City, and was Republic City or the City Of Spires under the Galactic Republic. The planet was code-named Triple Zero during the Clone Wars. The demonym and adjective form of the planet name is Coruscanti. Coruscant is the sixth planet out of 11 planets in the Coruscant System: (Revisse (Venus type), Platoril (Mercury type), Vandor-1 (Mercury type), Vandor-2 (Mercury type), Vandor-3 (Earth type), Coruscant (Trantor type), Muscave (Jupiter type), Stentat (Jupiter type), Improcco (Pluto type), Nabatu (Eris type) and Ulabos (Pluto Type). Coruscant has four moons; Centax-1, Centax-2, Centax-3, and Hesperidium. Beyond the system's planets was the OboRin Comet Cluster (Oort Cloud type), and in between Improcco and Nabatu was an asteroid belt (The Covey). The sun was called Coruscant Prime. Coruscant serves as the nexus of socio-economic, cultural, intellectual, political, military, and foreign policies activity within the Star Wars galaxy; at various times, it is the central capital of these governing bodies: the Republic, the Galactic Empire, the New Republic, the Yuuzhan Vong Empire, the Galactic Federation Of Free Alliances (Galactic Alliance), the Fel Empire, Darth Krayt's Galactic Empire, and the Galactic Federation Triumvate. The planet's strategic position relative to the galactic center, a population of 2 trillion sentients approx, and control over the galaxy's main trade routes and hyperspace lanes — Perlemian Trade Route, Hydian Way, Corellian Run and Corellian Trade Spine — that must converge and pass through Coruscant space, cemented its status as the richest and most influential habitable world in the Star Wars galaxy. The word itself originates in the late 15th century from the Latin coruscant- 'vibrating, glittering', from the verb coruscare. It is described in the Concise Oxford Dictionary as a poetic and literary adjective meaning 'glittering; sparkling'. The word "coruscant" is also a French adjective which means glittering, sparkling and, as a literary adjective, can be used to describe a decadent and overcomplicated language, decorum or community. The concept of a city planet in the Star Wars universe originated with the initial drafts of Star Wars, when author George Lucas included a planet called Alderaan which was a city-planet and the capital planet of the galaxy. In Lucas's 1975 draft, Adventures of the Starkiller as taken from the Journal of the Whills, Saga I: The Star Wars, the capital planet of Alderaan is described as a floating city in the clouds, "suspended in a sea of cirrus methane". This concept was illustrated in early sketches commissioned by Lucas from conceptual artist Ralph McQuarrie, and the design very closely resembles Cloud City, the floating city that featured in The Empire Strikes Back. 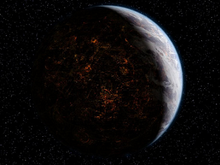 In Lucas's third draft, the Imperial City of Alderaan has become the home world of the Sith Lords, and Darth Vader holds Princess Leia captive here. Lucas continued to hone his script, aided by screenwriters Willard Huyck and Gloria Katz; names of planets and characters were revised and the narrative was improved, and by the fourth draft, scenes on the Imperial capital planet had been moved to a space station called the Death Star and the name of Alderaan was now given peaceful world destroyed by the Empire. The Empire's homeworld, Had Abaddon, came up in early drafts of Star Wars: Episode VI - Return of the Jedi. The entire planet was to be a sprawling city. However, concluding that the realization of such a city was impossible at the time, the creators abandoned the idea. Later, in the graphic novel Legacy 29: Vector, Part 10 the name Had Abbadon was given to a lost mythic planet in the Had Abbadon System of the Deep Core, which was covered by dry fields, was linked to the birth of the Jedi, was the location of a planned assassination attempt by Cade Skywalker on Darth Krayt, and was home to an Imperial. The Empire's homeworld first appeared in the expanded universe and was called Coruscant for the first time in Timothy Zahn's Heir to the Empire. Coruscant was first seen on screen in the 1997 Special Edition release of Return of the Jedi, and the X-Wing series of computer games. Coruscant was then seen (major appearance) in Star Wars: Episode I – The Phantom Menace. There is a speeder chase through the skies of Coruscant in Episode II: Attack of the Clones that eventually leads to a nightclub in the bowels of Coruscant's Uscru Entertainment District. Coruscant is seen in Episode III: Revenge of the Sith as part of the opening battle scene. The planet's cityscape is then prominently featured throughout much of the movie, with Chancellor Palpatine's office as well as the Senate building being the primary two settings on Coruscant. In various novels, characters aligned with the Empire refer to Coruscant as "Imperial Center". Within the stories, this is explained as an administrative renaming undertaken to emphasize the differences between the Old Republic and the Empire. Coruscant was in some early sources called "Jhantor" in homage to Isaac Asimov's Trantor. Production artwork produced by Ralph McQuarrie for Return of the Jedi had included some unrealised designs for the imperial capital, Had Abaddon. During production of The Phantom Menace, it was decided that scenes would be set on the capital planet, now called Coruscant, and artist Doug Chiang was tasked with designing the imperial city, and he turned to McQuarrie's original concept art. The appearance of the cityscape has been described as a "retro-futuristic metropolis", and the streams of floating vehicles travelling between soaring skyscrapers is thought to have been partly inspired by Fritz Lang's 1927 film, Metropolis. In Attack of the Clones, the depiction of Coruscant was expanded greatly. Chiang created a more urban, apocalyptic environment for the street-level, taking inspiration from Ridley Scott's 1982 film Blade Runner. Coruscant is a prominent location in both the Star Wars film series and the expanded universe media that has been produced. Within the narrative of the films, Coruscant-based locations such as the Jedi Temple and Jedi Archives act as the home for the Jedi and in plot terms are frequently used for exposition or to drive other elements of the plot. The planet is considered a Milliarium Aureum; the chronological and navigational center of the galaxy. The XYZ coordinates were 0,0,0 and the grid coordinates were L-9. The Galactic Standard Calendar was the standard chronometric in the Star Wars galaxy. It centered on the Coruscant tropical year. The Coruscant solar cycle was 368 days long; with a day consisting of 360 NET degrees (or 24 standard hours), the same as Earth. Numerous epochs were used to determine calendar eras. The most recent of these calendar eras used the Battle of Yavin (i.e. the destruction of the first Death Star) as its epoch, or "year zero": BBY (Before the Battle of Yavin), and ABY (After the Battle of Yavin). The earliest date in the Star Wars expanded universe as a whole is 13,000,000,000 BBY, which serves as the year the universe was created (though Coruscant's formation is not dated). James Luceno's novel Labyrinth of Evil introduces a deserted manufacturing area known as 'The Works' as the meeting place for Sith Lords Darth Sidious and Darth Tyranus. Another area of Coruscant shown is Coco Town (short for "collective commerce"). Coco Town is the site of Dex's Diner in Attack of the Clones. Another notable area of Coruscant is 500 Republica, an area where the crème de la crème, such as politicians and diplomats, gather. In Revenge of the Sith, a theatre in 500 Republica is where Chancellor Palpatine holds a meeting with Anakin Skywalker, while watching an opera. Coruscant is also the location of an additional sequence added to later versions of Return of the Jedi. In a montage scene, upon hearing of the death of Emperor Palpatine, citizens are seen celebrating with fireworks and by pulling down his statues. This version of Coruscant was not reused for the prequel trilogy. In the Dark Empire graphic novel's prologue, set after the original film trilogy, Coruscant is ravaged by battles between warring Imperial factions. In The New Jedi Order series, Coruscant is the capital world of the New Republic until, in The New Jedi Order: Star by Star, the extragalactic Yuuzhan Vong overwhelm the New Republic defenses in three attack waves, led by Warmaster Tsavong Lah, and take over the planet, destroying the New Republic and creating the theocratic Yuuzhan Vong Empire. After surrendering, the Yuuzhan Vong agreed to help the Alliance rebuild Coruscant. The new Coruscant is a combination of technology and organic life, to represent the peace between the Galactic Federation Of Free Alliances (Galactic Alliance) and the Yuuzhan Vong. With the 2012 acquisition of Lucasfilm by The Walt Disney Company, most of the licensed Star Wars novels and comics produced since the originating 1977 film Star Wars were rebranded as Star Wars Legends and declared non-canon to the franchise in April 2014. The Senate District was on the equator, and was home to the Ambassidorial Sector, (home to 500 Republica, the Senate Apartment Complex, Loijin Plaza, Nicandra Plaza and Nicandra Counterrevolutionary Signalmen's Memorial Building), Embassy Mall, Skysitter Restaurant, Bonadan Embassy, Colocaur Heights, Champalan Embassy, the Collunm Commons District, the Coruscant Opera House, the Galactic Museum, the Heorem Complex (Home to the Heorem Skytunnel), Judicial Plaza (home to the Glitanni Esplanade and the Judicial Arcology), the Legislative Borough, Senate Plaza, the Avenue Of The Core Founders, the Republic Executive Building, the Galactic Senate Building, Hospital Plaza, the Galactic Senate MedCenter, Novaplex, the Palace District (home to the Imperial Palace and Senate Hill), Quadrant A-89 (home to the CSF HQ, the Fellowship Plaza , the Galactic Justice Center and the Temple Precinct (home to the Jedi Temple)), Sector H-52, Sector I-33, the Uscru Boulevard, Westport and Xizor's Palace. It was the de facto capital of Coruscant, the Old Republic, the Galactic Empire, the New Republic, the Galactic Federation Of Free Alliances and the One Sith. It was constructed in 3996 BBY, bordered by the Financial District and the Sah'c District, was close to The Works, and went by the names Legislative District, Government District and Government Center. The walled Alien Protection Zone does not have a note to explain where on the planet it was, but it was likely to be on the equator. It was a segregated spot on the planet where all the aliens resided. Neighbourhoods there represented different species, and each resembled a different culture, making them feel homely, even if they were not. It was built in 19 BBY by the young Galactic Empire and opened by the New Republic in 6 ABY. Sah'c Town, also known as Sah'c District or Quadrant H-46, was an area on the Equator, named after and controlled by the wealthy Sah'c family. It was home of an emergency bunker where the chancellor of the Galactic Republic or New Republic ruled in case of an emergency (e.g., earthquake, volcano). Sah'c Canyon was also there, which was the exit point of the Senate District's Heorem Skytunnel. ^ Before The Phantom Menace was produced, the "sc" had a hard pronunciation, like a "sk", in various Star Wars merchandise; see the Thrawn Trilogy audiobooks for one example. ^ a b c Carey, C. R. etc. Coruscant and the Core Worlds. Renton, WA: Wizards of the Coast, 2003. P. 7. ^ a b Bouzereau, Laurent; Duncan, Jody (1999). The Making of Star Wars: The Phantom Menace. Ballantine. p. 13. ISBN 0-345-43111-1. ^ Rinzler 2008, pp. 351-400. ^ Hearn 2005, pp. 86-87. ^ Bouzereau 1998, pp. 67-68. ^ "An Annotated Guide to The Star Wars Portfolio by Ralph McQuarrie | StarWars.com". StarWars.com. 14 January 2014. Retrieved 20 April 2017. ^ Hearn 2005, p. 99. ^ Hearn 2005, p. 193. ^ Lamster, Mark (2013-07-02). Architecture and Film. Princeton Architectural Press. ISBN 9781568988375. Retrieved 21 April 2017. ^ "The Cinema Behind Star Wars: Metropolis". StarWars.com. Lucasfilm. 18 August 2014. Retrieved 21 April 2017. ^ Cotta Vaz, Mark (2002). The Art of Star Wars Episode II: Attack of the clones (1. ed.). New York: Ballantine Publ. Group. ISBN 9780345431257. ^ "Coruscant: Center of the Empire". Wizards.com. Rinzler, J. W. (2008). The Making of Star Wars: The Definitive Story Behind the Original Film. Ebury Press. ISBN 9780091924997. Retrieved 20 April 2017. Hearn, Marcus (2005). The Cinema of George Lucas. New York: Harry N. Abrams. ISBN 9780810949683. Retrieved 21 April 2017. Bouzereau, Laurent (1998). Star Wars: the Annotated Screenplays (1st UK ed.). London: Titan Books. ISBN 9781852869236. Retrieved 21 April 2017.